Check out Tobi's Amaya Suede Knee High Boots Let's be real: your shoe collection could use more knee highs. Amaya Taupe Suede Knee High Boots. These high heel boots feature a round toe, gorgeous faux suede, drawstring at the top for a tight fit, and a side zipper. Pair these vegan heeled boots with a corduroy skirt and cardigan. Let's be real: your shoe collection could use more knee highs. Amaya Taupe Suede Knee High Boots. These high heel boots feature a round toe, gorgeous faux suede, drawstring at the top for a tight fit, and a side zipper. Pair these vegan heeled boots with a corduroy skirt and cardigan. Let's be real: your shoe collection could use more knee highs. 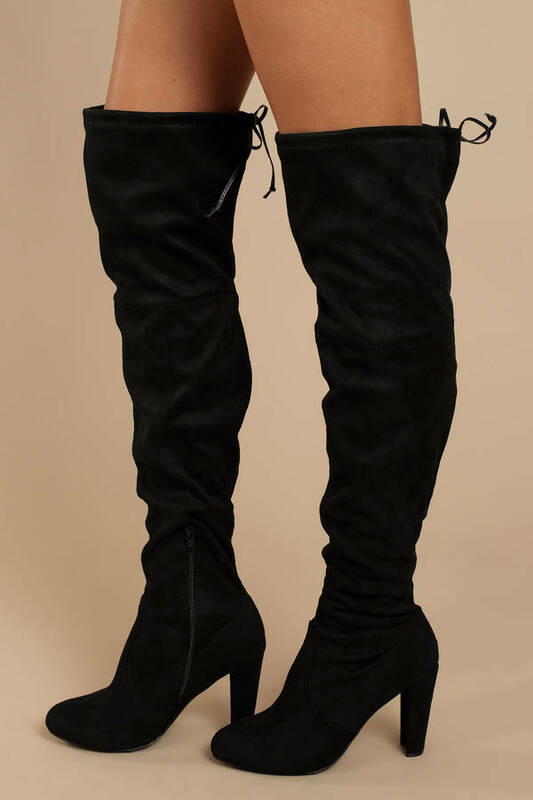 Amaya Black Suede Knee High Boots. These high heel boots feature a round toe, gorgeous faux suede, drawstring at the top for a tight fit, and a side zipper. Pair these vegan heeled boots with a corduroy skirt and cardigan.